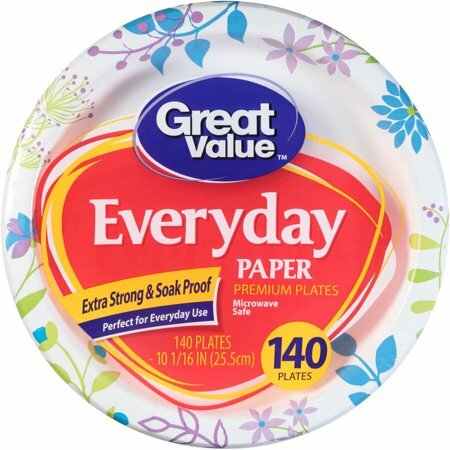 Keep your pantry stocked with the 140 Count of Great Value Everyday 10 1/16&quot; Premium Paper Plates. These disposable dishes feature extra-strong, soak-proof construction and have a fun pattern with bright colors. This pack of microwave-safe paper plates is ideal for all occasions, from backyard barbecues to everyday use. Quality Guaranteed: Our guarantee is our promise that you'll be fully satisfied with the quality of every Great Value product. If for any reason you aren't happy, we'll replace it or return your money. Whichever you prefer. All you need is the package and the receipt. It's that simple. Great quality. Great price. Guaranteed. Use this brand all the time. They are a great value. Beats washing lots more dishes. Im a widower with two adault sons living with me. I do most of the cooking and thet do the eating. We use these paper plates every day . Its a lot better than washing so many more plates. These plates have a plastic coating so they don't get soggy and fall apart . Last year I bought plastic paper plate holders at walmart and they give the plates more rigidity. I was out of my Tuesday and Friday plates and was all set to replace each when I came across these "everyday" plates. Skeptical at first, I decided to try them anyway. I'm totally blown away as I no longer need to reserve seven discrete places on my shelf for plates specifically designated solely for a single day of the week each. I remember having the same sort of epiphany when I discovered multipurpose pencils. Seriously, though, they're paper plates, they hold food, you throw them away and they're inexpensive. 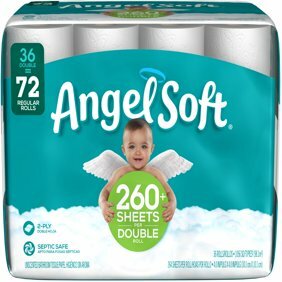 Just as good quality as name brand but costs less! I bought these for a bday party. They worked great! I got my money out of these plates!